The basic and fundamental products to treat a small average equine wound. From the fundamental cleansing of the abrasion / cut, to the application of antibiotic and dressings; including the exam glove to keep you clean and non-contaminate to the wound. 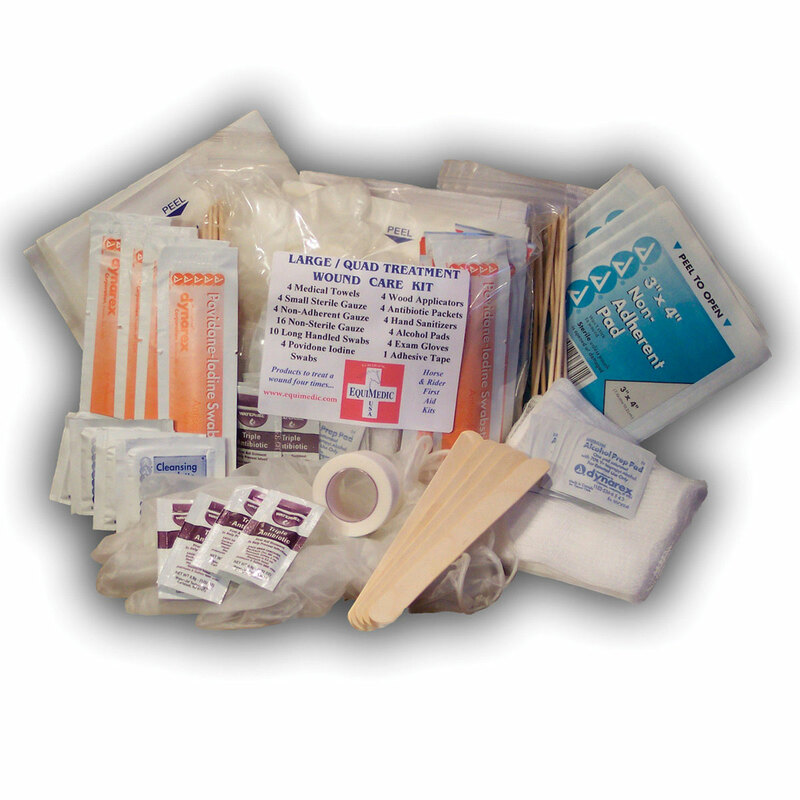 Choose from 4 wound treatment or serious wound/double treatment kit. If you ever have to face a serious equine wound you’re going to need some earnest products to deal with it and this mini kit will help you meet the challenge. Four-Wound Treatment contains 63 items: 4 medical towels, 4 small sterile gauze pads, 4 non-adherent gauze pads, 16 non-sterile gauze pads, 10 long-handled swabs, 4 povidone iodine swabs, 4 wood applicators, 4 antibiotic packets, 4 hand sanitizers, 4 alcohol pads, 4 exam gloves, and adhesive tape. 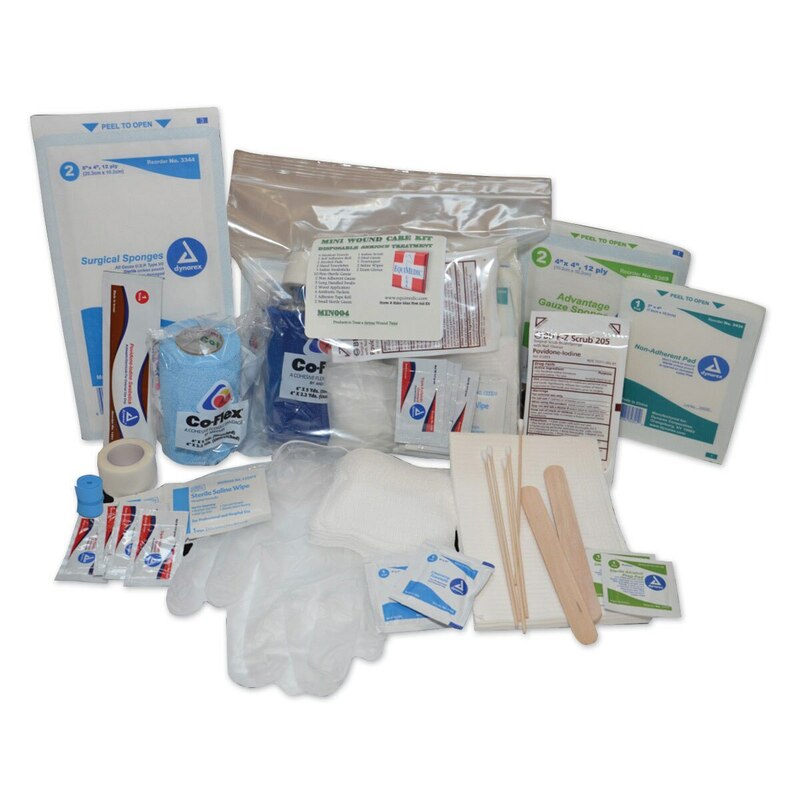 Serious Wound Kit contains 43 items: 4 medical towels, 2 small sterile gauze pads, 2 nonadherent gauze pads, 10 non-sterile gauze pads, 4 long handled swabs, 1 povidone iodine swab, 1 Betadine scrub, 1 tourniquet, 2 medium sterile gauze pads, 2 wood applicators, 4 antibiotic packets, 2 hand sanitizers, 2 alcohol pads, 2 exam gloves, Vetrap roll, 2 saline wipes, and adhesive tape.The Serious Wound kit (shown) should assist you in the care of a serious wound at least twice. Mini First Aid Kits is rated 4.7 out of 5 by 30. Rated 5 out of 5 by Beckham from Excellent started kit I bought this about a month ago to keep in my tack shed. I hope that I will never have to use it but wanted to make sure we had something in case. Rated 4 out of 5 by laurarfl from Good beginning for a first aid kit I bought this as the foundation for my first aid kit and then added some other items that my vet recommended. There are great items to stick into a trail pack in case of emergency. Rated 4 out of 5 by Jess from Simple First Aid Very basic kit. It does not come with the clear zipper bag as pictured though. Rated 5 out of 5 by MistyRidge from Just what I needed! Great started first aid kit. It will be good to carry on a trail ride. Rated 2 out of 5 by annie0 from Photo is misleading Photo makes it look like you get a handy plastic case and vet wrap. You don't. This is supposed to be for horses, but I would suggest a few more items to be a true horse first aid kit. I'm adding some bandaids and first aid cream and will add it to my 'people' first aid box. Only getting 2 stars because of Smartpak's amazing service. Otherwise it would barely get 1. Rated 5 out of 5 by StarLBI from Perfect For the Trailer I bought this to put in my trailer. I was amazed by how many things were in it when it arrived. For the amount of things this mini kit comes with, the price is amazing! This is also a great way to see what you usually need, so that you don't go buying big quantities of things you'll never use. Rated 5 out of 5 by StarLBI from Excellent Product This kit is the best thing to have in your trailer! It gives you everything you need, in small quantities so that you don't have to buy big packages of everything and never use them. The Mini First Aid Kit is filled with the essentials, and is easy to carry around. This is a great product. The only thing is that it comes in a ziploc like bag that doesn't seem too durable if left out for a long time.